Which is your favourite subject? Often, young kids are asked this question. Most kids are anxious about doing maths and find it difficult to understand the concepts. It is a general human tendency to dislike or avoid doing the things we do not understand. But if the foundation of maths isn’t strong, the learning of new concepts with each passing academic year makes maths a dreaded subject than an interesting and challenging one. 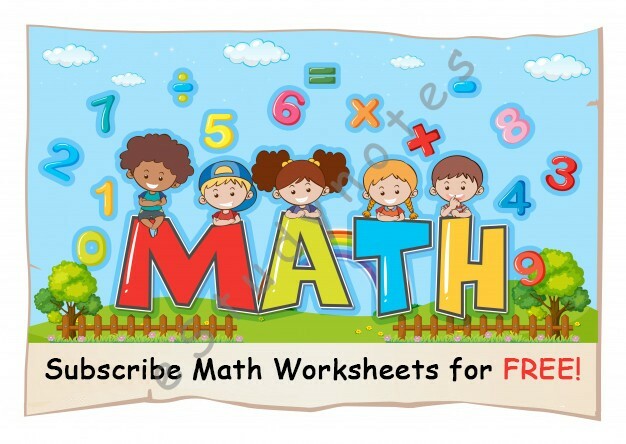 That’s why; printable math worksheets are preferred by educators and parents to develop an interest for the subject early in the life of kids, especially those in the age group of 5 to 7 years. You may be a parent busy with office work or with other responsibilities. Giving enough time to help your child may be difficult at times. But you cannot overlook the learning needs of your child. Math worksheets for Grade 1 and Grade 2 can be useful for helping your kids who are struggling with the usually confusing concepts of mathematics. Just pushing the worksheets towards a child already struggling with maths won’t help. Maths worksheets are learning resources that are available for various learning levels. You need to first understand the learning level of your children. Do your kids have quick grasping power or are they slow learners? Find out the number of worksheets that your kids will enjoy completing at a time. Do not give them too many worksheets just to complete a learning schedule. Start with fewer worksheets and increase the number as your child begins to grasp the concepts. It’s only if they are excited about learning, will they be more open to solving the worksheet problems. Once you understand the learning style, you can plan the number of math worksheets in your child’s learning plan along with the right time to give it to them as per their schedule. Worksheets are also a great way to involve your kids in learning-based activities during vacations. How Maths worksheets help your kids? Math worksheets are designed as per the core academic curriculum of your kids. For example, math worksheets for Grade 2 include logical thinking exercises to teach the concept of time and money. These exercises may be inappropriate and more complex for Grade 1 kids. The simplified puzzles in worksheets engage your kids to find solutions for problems which are presented in a story format. Also, worksheets consist of illustrations and colours that appear attractive to kids. If your kids dread the math book that’s full of problems, single worksheets will possibly give them the comfort of seeing and solving one problem at a time. Maths can become your kid’s favourite subject if they understand how problems are solved. Unlike other subjects where they can mug up answers to questions, maths is not a subject where mugging up helps. If your kids mug up tables but do not understand how multiplication works, it will confuse them eventually. It helps if your child uses a learning tool such as maths multiplication worksheets to understand the basics of multiplication. Learning the concept of money also becomes easier by practicing multiplication and division. Educate your kids from a holistic perspective by allowing them to understand what they are learning. Support your kids to excel in studies and develop good study habits with maths worksheets. To know more, visit estudynotes.com and get FREE subscription for 3 months.